It is so easy these days to find information if you want to learn something new. Search engines and You Tube are most people’s “go to”. There are video tutorials and often downloadable instructions readily available to teach and inform you- or bombard you. It’s so easy to click from one site to another, which can sometimes result in a minefield of overload, causing you to become anxious before you even begin. In this blog I try and demystify the ever so creative and highly addictive art of free motion machine embroidery. It’s not hard, you just have to relax, and be prepared to play. I often get asked “which machine would be best for machine embroidery?”. My answer is usually, anything that sews straight stitch, because that’s really all you need. Forget the fancy preset decorative stitches, straight stitch is all you need. I have stitched using very old solid machines and they have worked as well as some of the shiny new, all singing, all dancing machines too. With normal stitching, you have the dog teeth up. They move the fabric from front to back for you. With free motion machining, you don’t want them to do this so you need to disengage the teeth. 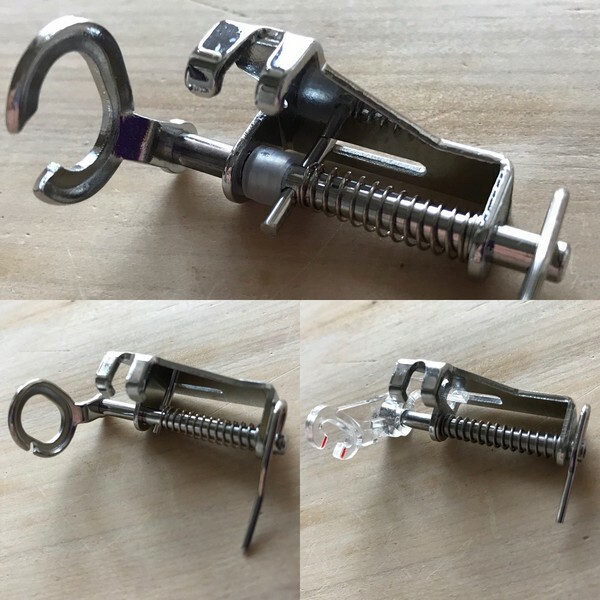 You can do this by 2 ways- dropping the teeth- there may be a switch, sometimes at the back or on the front or underneath in your bobbin case area, which you can flick to drop the teeth. (On old machines it may be a darning symbol). If your machine doesn’t have this switch then it may come with a darning plate which will clip over the teeth and allow free movement. (which invariably will not be as smooth as dropping the teeth.) With free motion machine embroidery, YOU need to be able to move the fabric around freely, in any direction, round and round in a circle, from side to side, from front to back, or from back to front. Either way, you need to be able to move the fabric freely and “draw” with the thread. If you don’t have the switch or the darning plate, you won’t be able to do free motion embroidery. You cannot do machine embroidery unless you have the right foot. It must be spring loaded which allows it to bounce. It can be called a darning foot, a free motion quilting foot or a machine embroidery foot. I use a closed darning foot if I am stitching over different thicknesses such as crazy patchwork, otherwise I use an open toe darning foot. It enables me to see exactly what I am stitching. 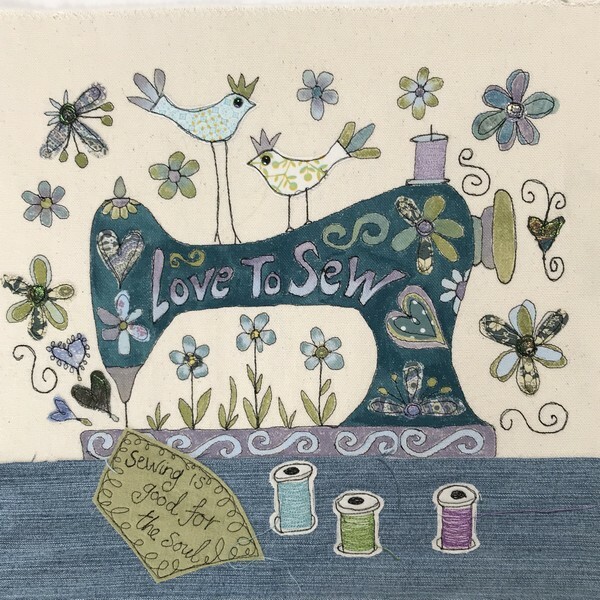 Some talented stitchers’ will use free motion stitching with no foot, but the fabric will be hooped up tightly and you must be prepared to stitch quickly. This is very scary to the inexperienced, and I wouldn’t suggest you start in this way. I have several rules which I follow. If you pull a length of thread, look at it closely, it must be very even all the way along- if it is irregular or bobbly, you may experience difficulty. When you try and pull on the thread in opposite directions, the thread must be strong. If it snaps easily, then it will snap constantly when you are machining. Don’t forget that even good quality threads can go brittle if left out in daylight for long periods of time, so just do the strength test first. The thread must not be too thick, so a 40 or 50 weight is usually best- anything thicker ( lower in number) will not stitch easily. As a general rule of thumb, I use a good quality thread on the top but I nearly always use a cheaper alternative in the bobbin. Some people advise that the top and bottom thread must be the same- this depends entirely on your machine, my Janome is quite forgiving. Cotton is preferable but I do sometimes also use rayon threads. 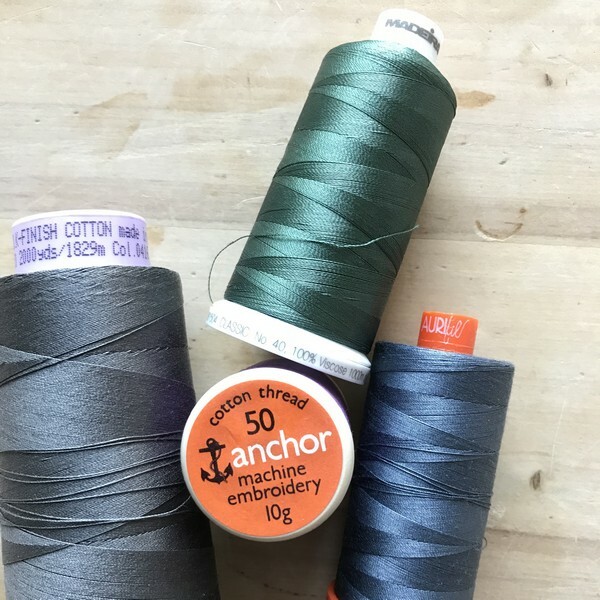 Metallic threads are a whole other subject- another blog, another time! My favourite colour to stitch with is brown or grey, rarely black which can look quite harsh. 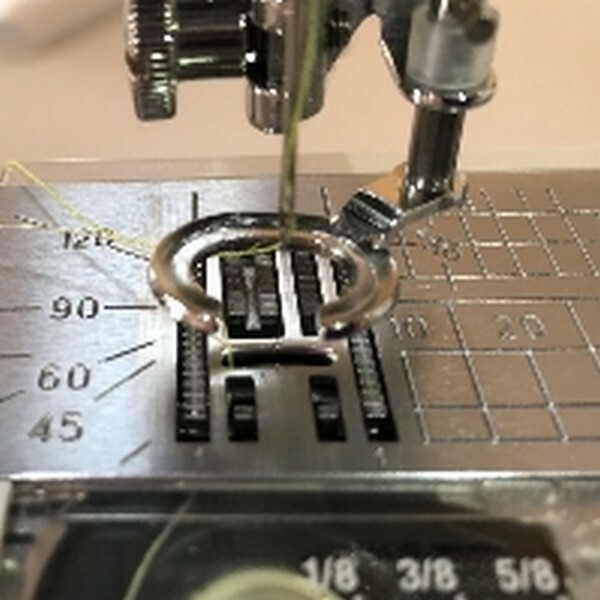 Generally I use a regular machine needle, so a size 70-80 for a 40 weight thread- if your thread is heavier (smaller number), increase your needle size (larger number). If you are using a thicker thread you may benefit from a top stitch needle. If stitching a lot of paper, I would use a leather needle as it has a chiselled tip. Do change your needle now and then. It is so easy to blame everything else when things go wrong but it can just be a slightly bent or blunt needle. Often the first thing that puts people off machine embroidery is the wooden hoop. It can be so frustrating battling with trying to get the hoop under the foot when starting out . I now teach machine embroidery using a sturdy cotton canvas, no hoop in sight. Everyone can just concentrate on drawing with the thread, and being creative with the stitching. Once they have cracked it, then using a hoop is easy. Sometimes, if using a thinner fabric, I may use a stabiliser, such as a tearaway or an iron on interfacing. I always use a straight stitch with the stitch length on 0 or as low as you can set it- some machines only go down to 0.5 or 1. Your stitches should be even on the front and the back with no loops. If the bobbin thread shows on the top, you need to lower your top tension. Try and stitch again, lowering the number by 1 at a time until the stitching is smooth. Mine is set on 4 or 5 and on my machine I don’t need to lower the tension but your stitching will tell you. Once in the flow and stitching at speed, you may experience a birds nest underneath, this is usually for one of two reasons- either you have left the presser foot up or the thread has slipped out of the hook in the bobbin case, so you will need to re-thread the bobbin. 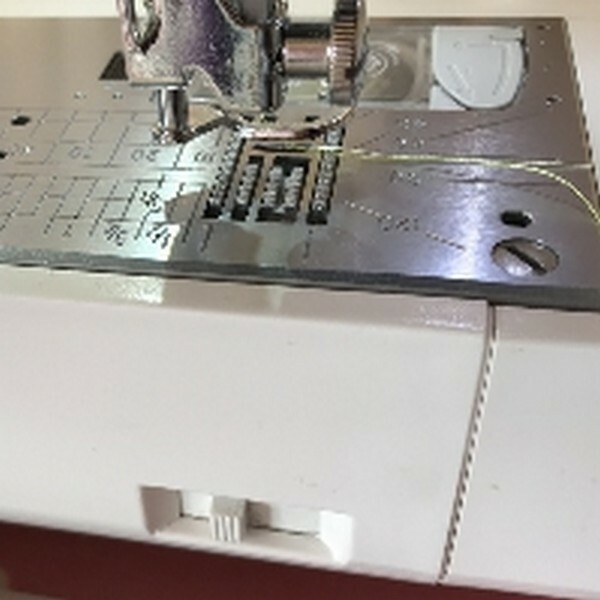 You may well be an experienced stitcher, in which case your brain is used to seeing the fabric move quickly the harder you press the foot pedal. With free motion machine embroidery, you have to forget that relationship. My motto is – Fast foot, Slow hands. It seems so strange at first, but after a while you’ll see that you don’t have to move the fabric quickly- but it helps if you keep the revs up. You are aiming for a smooth drawn line of stitching. If you move the fabric too quickly, the stitches will be too long, equally if you leave your fabric in the same place and continue to stitch, the stitches will build up to create a raised blob of stitches. 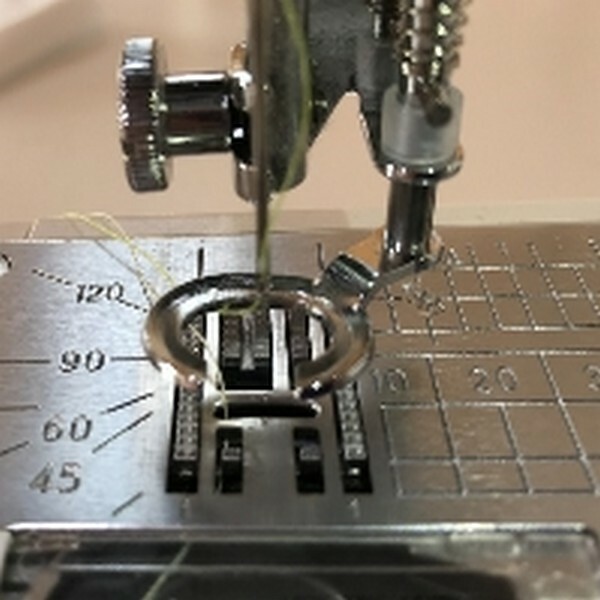 The success of your stitching totally depends on the synchronisation of the speed at which you move the fabric, with the speed at which you press your foot down. This does take practise, but do persevere. Don’t feel like it’s running away with you, you are in control. Once you have “clicked”, you will always pick up that speed next time you set up the machine, it is just like riding a bike.